One day that has always troubled me is Mother’s Day (and maybe Father’s Day too). The advertisements start coming out weeks before, to create feelings of guilt and obligation. I don’t see articles full of constructive family bonding activities – it is rather about buying gifts, flowers or going out to lunch. Well, I have decided to boycott the commercialism that surrounds Mother’s Day. Flowers are always fabulous, but they are devilishly expensive and half the price at any other time. Gifts – I would prefer to skip the fragrant soap and get a better birthday present rather. And as for going out on Mother’s Day – you have to be joking! Overcrowded restaurants, bad tempered and slow service, and disappointing quality food turned out by kitchens that are battling to cope with the volumes. I don’t want another meal served at 3pm while sitting around being aggravated by kids who constantly zoom by me in their scooters! I detest those scooters and parents who take their kids out with scooters to restaurants are a menace! What are they thinking??? Take your mother out for a meal, of course you should. But just don’t do it on Mother’s Day! Make your own Mother’s Day a week earlier or later, or you could try my favourite – dining out on a Monday! It chases away the Monday blues and gets the week off to a good start. Ok, so now that we have agreed not to go out on Mother’s Day, what shall we do? Mother’s Day is not about commercialism but it has become a day when families get together. So, get a few bottles of mom’s favourite wine or champagne and get into the kitchen to cook something fabulous – in fact, go the whole hog and prepare a family feast – starters, mains and desserts. Obviously, this is a good time to choose your mother’s favourite meal and not your own. Spending too much time in the kitchen defeats the purpose of a get together on Mother’s Day. 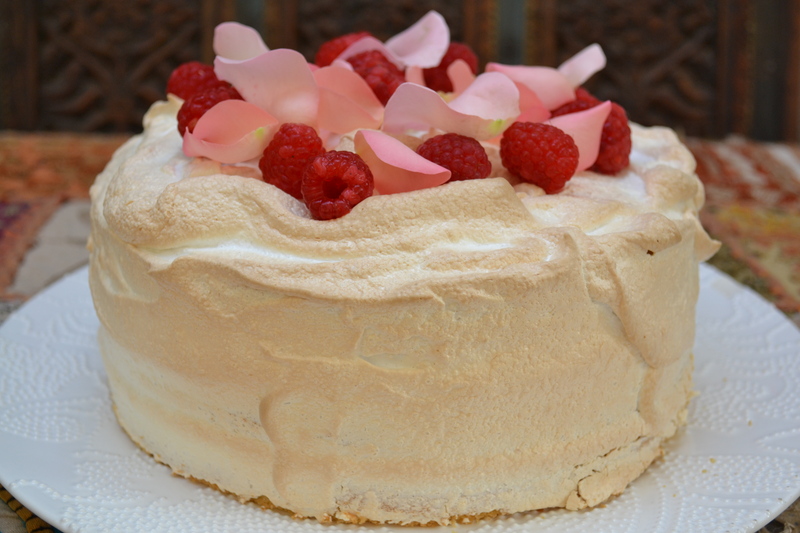 End the meal with a Raspberry Meringue Cake. This light, airy sponge is smothered in a meringue frosting and baked for a few minutes – it looks like a gooey marshmallow cake! Preheat oven to 180 degree celsius. Grease and line three 20cm (8 inch) cake tins. Sift the flour, salt, baking powder and cornflour twice. Divide between the three cake tins and bake in a preheated oven for 12 – 15 minutes until the cake slightly shrinks away from the tin. Spread the raspberry jam over two of the sponges and sandwich the cakes together. Whisk 4 egg whites until soft peaks form. Add 185ml sugar a little at a time until the meringue is stiff and holds its shape. and sieve icing sugar over. Place the cake on a baking tray and frost the cake with the meringue mixture. Bake at 200 degrees celsius until the meringue is pale golden brown in colour. Use strawberry jam and fresh strawberries to garnish if raspberries are not available. I usually serve this with whipped cream on the side or drizzled with woolies double thick cream. 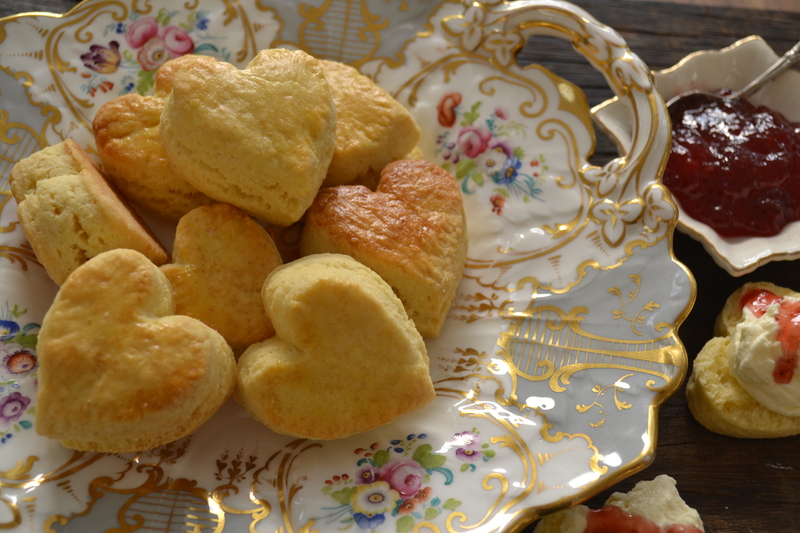 Dip the scone cutter into flour and cut out rounds or hearts. Gather the off cuts and gently knead into a ball. Repeat the process until all the dough has been used up. Serve warm scones with butter, strawberry jam, cream or with grated cheese. I am so going to try this!!! Thanks for the amazing recipe. For people who don’t want to use eggs what substitute can be used? An egg substitute would depend on the recipe…is it for baking? Love your recipe’s.Today semolina cake yah. 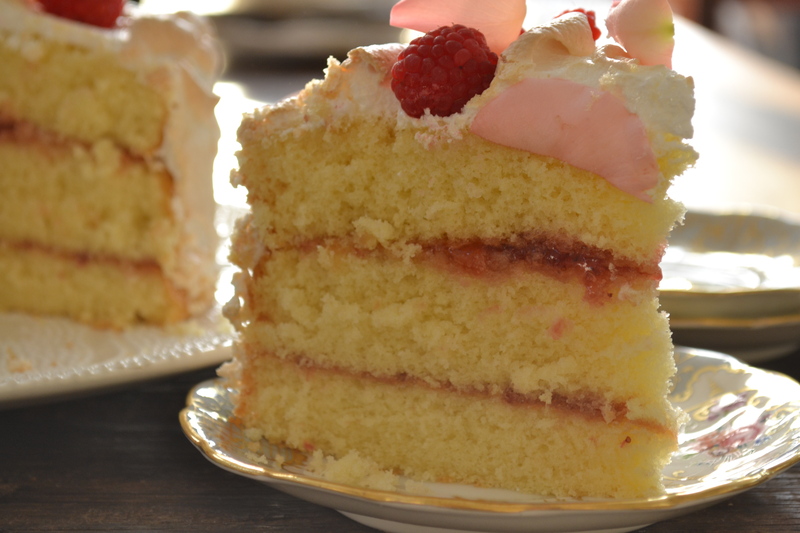 I love the texture and flavour of this cake! One of my favourite favourites!